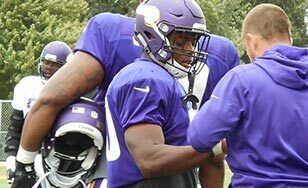 CSS student Mitch O'Neil tapes Vikings fullback and Duluth native CJ Ham's thumb. For aspiring athletic trainers, the big leagues don’t get much bigger than the NFL. Lifelong football fan and St. Scholastica athletic training graduate student Mitch O’Neil lived out the dream of would-be athletic trainers everywhere when he completed an internship last summer with the Minnesota Vikings. "I couldn't have asked for a better opportunity to be at this high a level as a student," O’Neil said. O’Neil has been a football player his entire life, from his youth in Rogers, Minn., to his four years on the St. Scholastica football team during his undergrad career. He graduated with his bachelor’s degree in exercise physiology in 2016. Being selected for the highly competitive Vikings internship was a golden opportunity, he said. He was amazed at the size and scope of the Vikings operation. "You get to interact a lot with all of the doctors there," O'Neil said, "and all of the chiropractors, massage therapists, athletic trainers and strength and conditioning coaches. You get to meet the whole realm of health care professionals that deal with these high-caliber athletes." During his internship this past summer at the Vikings’ practice facility in Mankato, O’Neil found out what the life of an athletic trainer to the pros is really like: 12-hour days, seven days a week. "Even when the players get a day off, we’re still in there giving treatments for people that have to come in. There’s never a day off in the life of an athletic trainer. There’s always an athlete that needs care." Much of his time was spent helping the team’s trainers prepare the facility before practice, setting up treatment stations and water tables. Making sure the athletes stayed hydrated was a major component. "During practice we’re always pushing water, making sure they’re getting what they need to stay hydrated," O’Neil said. "Once we have all of our duties done, we help out with giving the players treatment. We got to do some hands-on stuff." O’Neil admitted he was a bit star-struck at the thought of interacting with the Vikings players. But once he settled into his work, it faded quickly. "You just get in the rhythm of doing your job every day, and by the end of it they’re just normal guys, and they’re all really nice guys," said O’Neil, who expects to graduate in spring 2018. Amy Brugge, Ed.D., assistant professor of Athletic Training, said O’Neil’s internship gave him a priceless hands-on learning opportunity. "It provided him with an immersion experience that was rich in terms of working with an interdisciplinary team," she said. "It was a good insight into what that level of sports medicine care looks like, both in terms of time commitment and an interdisciplinary healthcare team for elite athletes. "I think he learned a lot in terms of time management, composure, poise and professionalism. It was a good experience beyond what he normally does in his clinicals." St. Scholastica has an entry-level master's AT program that can be completed in under two years. AT alumni have a 100 percent job placement rate. For more information, visit css.edu/at.